The long-term benefits of colostrum have been documented, with improved live-weight gain and health status leading to earlier joining dates. Calves receiving larger volumes of colostrum at birth have shown to have less veterinary costs in the pre-weaned period and produce more milk per day in the both the first and second lactations. Therefore, a successful colostrum management plan has direct and indirect advantages in the short-term and long-term future of replacement heifers. The immunological and nutritional benefits of colostrum have long been established. Due to the nature of the bovine placenta, direct transfer of antibodies from the cow to the unborn foetus via the blood CANNOT occur. Antibodies are part of the immune system and are responsible for helping the body fight off disease. This means that calves are born without any antibodies, rendering them extremely susceptible to infection. Colostrum is not only a nutritious feed, it is also an important source of antibodies for calves. The ONLY way calves can obtain functional antibodies is via the oral ingestion of colostrum at birth. From birth, the calf’s immune system will start to develop and produce its own antibodies but these will not be at functional levels until 4-6 weeks of age. Inadequate colostrum consumption provides an opportunity for pathogens to cause disease during this critical time. What can happen to colostrum during the collection and storage process? The hygienic collection, storage and subsequent feeding of colostrum to newborn calves is a multi-step process. This multi-step process is not only inefficient but also increases the risk of contamination of colostrum at each step. Along with the direct disease-causing effects of these pathogens, this contamination can interfere with the absorption of colostral antibodies by the calf, thus reducing the immunity transferred from colostrum. Storage of colostrum, either in the refrigerator or frozen, allows convenient availability at all times. A shortfall of fresh colostrum may arise at the beginning of calving when heifers may calve before the cows: heifers commonly give low volumes of colostrum and thus supply may be limited. However, storage of colostrum is not without its challenges and our clients often tell us that the collection of colostrum, transferring into a container, freezing, defrosting and then transferring into a tube feeder, is a slow and inefficient process. All these steps increase the risk of contamination. Typically on farm, colostrum is collected from freshly calved cows and stored in buckets or similar (plastic or stainless steel). But there may be many more steps before this colostrum is actually fed to the calf such as the transfer to other buckets, smaller containers, tube feeders and teat feeders. A study in the USA showed that very little bacteria was present in colostrum taken directly from the udder, and that it is during the collection process that colostrum can become heavily contaminated with bacteria. In the study there was nearly four times the bacteria present in colostrum from the dairy-floor bucket compared to that taken directly from the udder. Possible sources of contamination could include the teat skin, milking cup liners, hoses or the bucket itself. 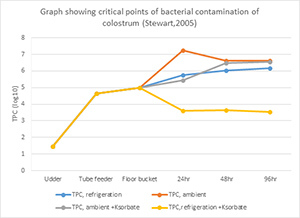 The study demonstrated that the collection of colostrum is a significant control point for contamination. Sub-optimal cleaning of collection buckets, tube feeders and teat feeders will exacerbate this problem. What is the Perfect Udder? The Perfect Udder colostrum management system comprises two different sized bags, attachable teats and tubes along with accessories to enable efficient filling of the bags. The bags come in two sizes: 3 quart (2.8 litre) and 4 quart (3.8 litre), allowing colostrum to be delivered in a single feed for larger calves. Smaller calves may need this volume split between two feeds. The bags are designed to be single-use to ensure that all calves receive the correct volume of clean colostrum. New teats and tubes are provided with each kit and these can be easily sanitised between each use. What are the benefits of the Perfect Udder? The Perfect Udder system allows colostrum to be transferred directly into one bag, which can then be refrigerated, frozen, thawed, reheated or even heat-treated before being fed directly to the calf. There is no need to transfer colostrum between containers. These features improve the efficiency of colostrum feeding to calves, whilst maintaining biosecurity. As the bags are disposable, there is no clean up after use. This saves time, improves staff compliance and consistency with feeding and ultimately helps promote calf health. How can the Perfect Udder bags be stored? If colostrum is collected and not fed or heat-treated within 2 hours, it should be stored in the refrigerator or frozen. 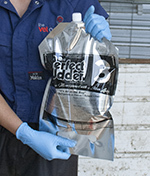 The Perfect Udder bags can be easily stored in the refrigerator and then used as required. The secure screw-on cap allows them to be safely stored flat without the risk of any leakage. In the absence of heat treatment, potassium sorbate can be added to colostrum prior to filling the bags and then refrigerated until fed. All bags can be easily marked with the date of collection. A fridge thermometer is essential to monitor internal fridge temperatures. Pre-chilling is required (15oC in 30 minutes) prior to refrigeration to maintain ambient fridge temperatures of 4oC. For long term storage of colostrum, the Perfect Udder bags can be frozen and then thawed prior to feeding. The bags have a clearly marked fill-line which should not be exceeded, to allow expansion during the freezing process. Frozen bags can be stored on top of each other with the thin protective foam between them, to prevent piercing of and by the bags when they are frozen. This foam is provided with the bags upon purchase. The thawing process of frozen colostrum in the Perfect Udder bags is up to four times faster than conventional bottles. This has the major advantage of providing usable colostrum as quickly as possible but also reduces the time period for complete thawing. In turn this reduces the opportunity for bacteria to re-grow in the thawed colostrum. Once thawed and reheated to 32oC, a teat or tube can be easily attached to the bag and the colostrum fed. Reheating can occur in a warm water bath or using the Reheat Cycle of the DT Platinum series pasteurisers. If heat-treatment of colostrum is required to reduce colostral contamination further, this can easily achieved using the Perfect Udder system. The Dairy Tech Platiumun Series of heat pasteurisers allow filling from the heat treatment vat via a specially designed tap which enables the Perfect Udder bags to be directly attached. Alternatively a Bag Guard is also available for these pasteurisers to enable heat treatment of colostrum within the bag itself. The bag design allows optimal heat exchange for efficient heat treatment, cooling and reheating. Potassium sorbate can be used in conjunction with heat treatment but needs to be added afterwards to avoid curd formation during the treatment process. The Perfect Udder system would provide some benefit on all dairy farms. The ‘closed-system’ from collection to feeding helps deliver the best possible quality colostrum to calves by reducing the steps involved and therefore risk of contamination. The Perfect Udder system overcomes the problems with colostrum storage and subsequent feeding. The single-use bags eliminate any staff compliance issues relating to thorough cleaning of feeding equipment between calves. Smaller dairies may wish to use the system for long-term storage only whilst larger dairies may utilise the bags on a daily basis. Purchase The Perfect Udder Colostrum Management System.